Mercifully, this was my first ‘Transfer Deadline Day’ for some years which remained untouched by the hype and breathless speculation of Sky Sports News (I cancelled my subscription some months ago). As it turned out there was probably no need for that particular network’s passion for sensationalism, as another day of extraordinary gambling in the transfer market unfolded with Fernando Torres heading for Chelsea for £50m and – in perhaps the most eyebrow-raising move of recent years – an apparently reluctant Andy Carroll making the switch to Liverpool from Newcastle for £35m. Every year one of the over-monied English Premier League clubs takes an extraordinary leap for a seemingly ordinary player, and every year there is the inevitable chorus of “this can’t go on”. Yet we know there will be more of the same in the summer and another rash of panic-buying a year from now. There seems no end in sight for a level of spending we all routinely refer to as unsustainable. I’m no enthusiast for Tottenham Hotspur but – even for a club managed by Harry Redknapp – they too had a remarkable Deadline Day. Bids for Carroll, Blackpool’s Charlie Adams and a seemingly endless pool of £38.5m-rated Spanish centre-forwards were capped by a £500,000 approach for Everton’s Phil Neville, a move their manager David Moyes described as ‘insulting’. 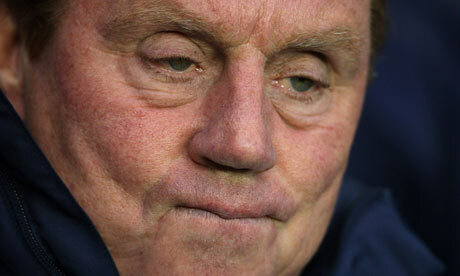 Redknapp, of course, is great copy for the sports journalists during the transfer window. Not for him the quiet reticence of only speaking when you actually have something to say – Harry loves nothing better than discussing other clubs’ players, giving the nod to the journos about the ‘deals’ he’s working on. Some regard him as something of a national treasure, the coming saviour of the English national team. Others see him as a throwback to another era, when players moved on a nod and a wink and everyone in the game ‘looked after each other’ as it were. Personally I see him simply as an irritant, someone who should learn the concept of good manners and not ‘tapping a player up’. I’d quite like him to take the England job, sooner rather than later preferably, because I’m fed up of Spurs looking like they might be successful. It’s hard to imagine him as a national coach, however. No transfer market and therefore no opportunity to make public overtures towards Spanish forwards who might be able to “come in and do a job for us”. It would be destined to end in tears, but would no doubt be hugely entertaining along the way. I never quite understood the rationale behind the transfer window. It always seems to be unfairly restrictive on the clubs with the smallest squads and the tightest resources. Newcastle, for example, now find themselves a key striker down with no chance to bring in a replacement until the summer. The ‘big’ clubs, by contrast, can afford to splash out heavily with a few hours of the window remaining, thereby reinforcing their dominance on a league already controlled by sugar daddy owners with deep pockets (or, in the case of the Glazers at Manchester United, large overdraft facilities). Perhaps the worried cries of unsustainability over the years have been wide of the mark, but Deadline Day does rather preserve the status quo – the one reason above all others that nothing’s likely to change soon. Well said that man! Lucky for us that Sir Alex is happy with a settled squad (the near-invincibles, the almost-invincibles or the blink-and-you-might-miss-the-title-um-ibles?). Good luck on the run in and good luck hanging onto Fabregas in the summer. The whole thing is ridiculous. Wealthy football clubs are like teenagers with a bank card – fill the account and they just have to spend it. Far from being reluctant, Carroll foolishly handed in a late transfer request thus making sure Mike Ashley will be spared much of the blame for Newcastle, once again, letting a key asset go. I love football but the only people who benefit from transfers are Sky Sports, mercenary players and footballer’s agents. Meanwhile, my lad along with other supporters are left upset over the departure of their heroes. Sadly, people with many years more experience have learned to be very cynical about loyalty. Not many Ryan Giggs’ about. Spurs will carry on only LOOKING as if they might be a success while Arry’s there. His good fortune in finishing 4th when Benitez sold Alonso but only replaced him with a guy who hardly played, and winning the cup the year the big four imploded will soon expire. They don’t call him Houdini in Soton, either.